What can we say about all this? If God is on our side, can anyone be against us? God did not keep back his own Son, but he gave him for us. If God did this, won’t he freely give us everything else? If God says his chosen ones are acceptable to him, can anyone bring charges against them? Or can anyone condemn them? No indeed! Christ died and was raised to life, and now he is at God’s right side, speaking to him for us. Can anything separate us from the love of Christ? Can trouble, suffering, and hard times, or hunger and nakedness, or danger and death? Looking back, I thought I had it right. It was a faith of sorts, just one without much testing. You know, it’s another one of those things we tell one another, “no testimony without a test.” I don’t think I didn’t have faith, but lately good friends who are praying and counseling me through this take me back to The Word, reminding me that “the refiner’s fire is hot, I know, but the end result is beautiful. Hang in there.” I am thankful that my Christian friends are not the drive-by variety. As to the specifics of my fraud? I spent the last three years writing about joy found amidst the deepest pain, and that is true. I committed to seeing silver linings hidden within the stormiest clouds, sharing encouragement that despite where you are, where I am, we should say “YES” to God anyway. Here’s the falsehood—having struggled so long for so little (it seemed), I came to the realization that my optimism was all about lowered expectations. I’d nearly stopped believing things could ever get better, so when they didn’t, I wasn’t disappointed. You can’t be disappointed by not winning if you always expect to lose. I was being positive, but definitely in the poorest way. I was a fraud. Fortunately, THANK GOD, HALLELUJAH! He doesn’t need us to be fully committed in order to witness His Miracles. In order to shake me out of the prison of my own despair and lift my head so I could find joy in the Light of the Son again, He began to bless me, to move at a pace I call Godspeed (really, really fast). God moved obstacles, walls, fear, mountains to change my circumstances along with my heart…on the very day I confessed my brokenness in a way I never had before, on the very same day I wept openly because everything I desperately tried to hold together in the midst of my fraud was falling apart. While the inspiration for this message of confession and encouragement comes from Romans, it is also the words of Job in the midst of his anguish that encouraged me, and should encourage you to say “YES” anyway. Remember Job? It was he who wrote, “even after my skin is destroyed, Yet from my flesh I shall see God.” (Job 19:26) THAT is how you say “YES” anyway. God loves us so much that He doesn’t even need us to be fully committed at the moments He moves in our lives. (<==== Click to tweet) When God is for us, even WE cannot oppose Him in the fulfillment of His Will for our lives. It’s time to say “YES” anyway. 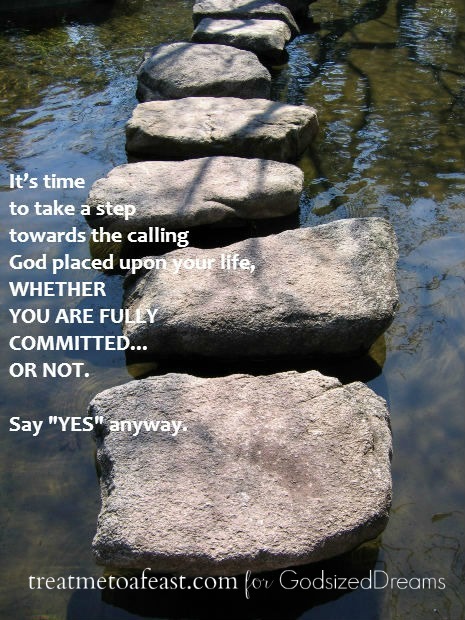 It’s time to take a step towards the calling God placed upon your life, WHETHER YOU ARE FULLY COMMITTED OR NOT. Neither “life nor death, not angels or spirits, not the present or the future” shall ever separate us from God’s Love and His Plans for us. Not our fear, not self-sabotage, NO THING. Not even a well-constructed, well-intentioned falsehood, like the fraud I created and now humbly confess. I’m walking towards the dream He planted within me, writing stories, confessing struggles, admitting the failures, and leaning on Him and on the sisters He gave me for the good times and all the other times. I’m saying “YES” anyway, because saying “YES” is what it means to step out on faith. 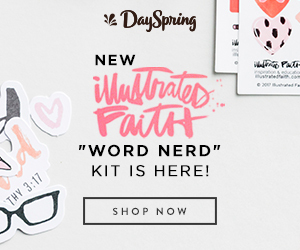 This week we’re sharing a small step we’ve taken towards our God-sized dream. One way we’ve said yes, despite fear, doubt, and knocking knees. For next week, let’s discuss an important truth regarding God-sized dreams. How do we make sure to keep God first while we dream? This is beautiful and strikes a chord with me because I have so many of the same thoughts and feelings! You have beautifully articulated your thoughts — praying for you as you walk the steps toward your dream! I am praying you through because I know that it was only the prayers of my friends and family who pulled me through my storms. I praise God that His Word is true and He never Fails…otherwise, I’d be a total mess. Here is what I’ve learned; it’s alright to be afraid as long as you don’t let fear paralyze you into doing nothing. It’s alright to have shaky faith even, because while we may waver, He never does. I am praying that you will have just enough courage to run toward your dreams straight into the Arms of God. This is SUCH a beautiful and transparent post. Thank you friend for reminding us that God uses us, preforms miracles even when we don’t believe it can happen for ourselves!! 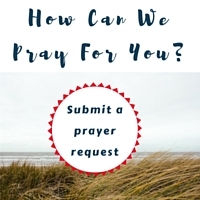 Part of the lesson is that God dispatches His children to pray for and encourage one another. I learned that lesson again from you, and I bless God for your servant’s heart every day. Thanks for believing in God’s Vision for me even when I wanted to give up. Yes! I’m coming along. Beautiful you. Beautifully broken and shining His light through the cracks. broken? That’s me. Beautiful?? When viewed in the light of God’s love…we all are. What a beautiful testimony of what He can do…I love this, friend! Here’s to walking each step, trusting that He can…and that He will. Powerful words today…thank you! you know the feeling of walking through the dark, following the voice of someone you trust? Y’all called me through, with your faithful prayers. I needed to share that encouragement for anyone else who’s about to give up, like I almost did. Thank you for the encouragement to keep moving even when we aren’t “feeling” it. God cares more about our obedience and faith to trust Him in and out of the storms. I ALWAYS need this reminder of God using me and working despite me!! Beautiful words here, Chelle! encouragement even when we aren’t feeling it? That’s what friends are for, right? Go, brave girl! And to think a couple of weeks ago, we were not so brave. Sometimes, I get so caught of in the fear of being seen as the fraud that I am that I simply do not act. I don’t say, “No, per se, but I don’t say, “Yes,” either. So, today, I will be more intentional about saying yes to what I think God is calling me to, and for. Thank you, Chelle! ‘Liv, hand in hand and heart to heart, we don’t have to be brave alone. For all the times you have prayed encouragement over me, I am cheering and seeking God’s Face for you. Thank you, from the bottom of my heart for your encouragement. I am only brave because I have a supportive circle of faithful sisters who bear me up, call me out, encourage me to take risks. Never underestimate the value of community; it has changed my life. I encourage you to use us as sounding boards, prayer warriors, accountability partners. We are blessed to share what we’ve learned knowing that God blesses what He pours into us when we give it away. For a few weeks now I have been “on the fence” because of my fear. I had just decided this was the week for me to take the leap and complete the first step. Thank you for writing this post and “pushing” me further down the conviction of needing to start the first step. I don’t ever want to get to the end of my life and wonder what might have happened. I have committed to taking risks, in faith, and I’m cheering you on…we all are. Woooo-hoo Tina!!! YOU GO GIRL!! Beautiful post. If things were perfect for us, we would never need Him. The trials in our lives are treasures in His eyes. I love that His timing looks different than ours and that He always has a plan. so true. “The trials in our lives are treasures in His eyes.” Yes! He is the God of the impossible…and our God of revelation. Thankfully, as we walk with Him, He will bring miracles to pass, sometimes despite us! Oh, this has hit home with the strength of a lightning bolt. Thank you for sharing! Hallelujah! So glad to be used. Our honesty is how we bear one another up, yes? Brave, brave words. Thank you for setting the tone to be honest. We can’t be on the mountaintop with our dreams all the time, and admitting the valley moments (and thoughts) are the only way we’ll get back up there again! Blessings, sister! Thanks. It is easy to be brave when you’re in a safe space. I pray this will be a safe haven and sheltering place for we who dream. “I have realized lately how God wants more for me than I want for myself…” Wow, Dolly, you really know how to take it there. I have the greatest respect for your transparency, and your servant’s heart. I love that you hear His Voice even when the message is one that stretches you in uncomfortable ways. Yes, dear heart, I know you’re cheering, and I feel the warmth and depth of your prayers, and I thank God for you every day. Every. Single. One.